The extended header of an e-mail contains relevant information with which the mail.com customer support can help you in case of a problem. If you have questions about sending or receiving an e-mail, always send mail.com customer support the text of the extended header. 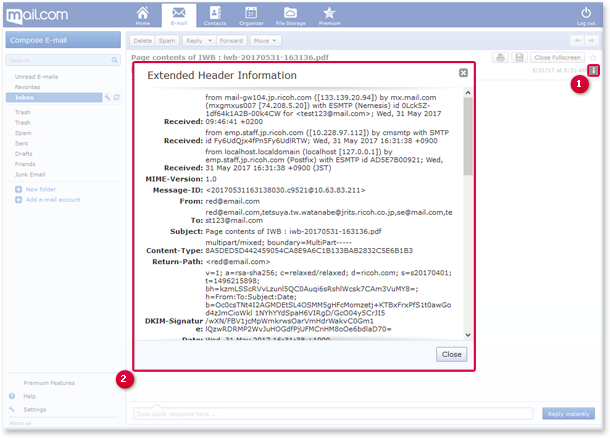 You can see the sending history of an e-mail with the help of an "extended header". Click the information symbol in the relevant e-mail. A window with the extended e-mail information will open. Hold down the left mouse button to select the text, and copy the selected text by pressing Ctrl + C.
Open a new e-mail and paste the copied text into the message body by pressing Ctrl + V.
Send the e-mail to the e-mail address specified by the customer support employee.